I went with a breakfast A+B mix & match deal. 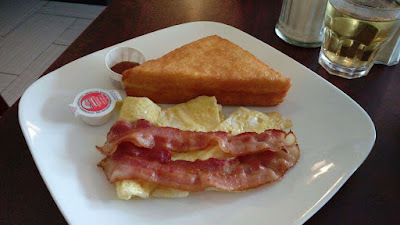 From the "A" list, I chose Bacon and Scrambled Eggs with French Toast 煙肉煎雙蛋配西多士. The bacon was not cooked crispy. The HK-style French toast had very minimal marmalade. Nothing to note about eggs. 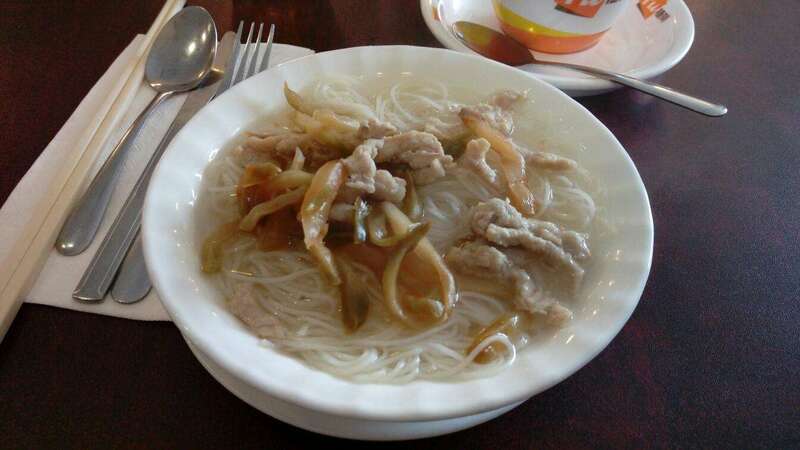 From the "B" list, I went with Preserved Vegetable and Shredded Pork with Noodles in Soup 雪菜肉絲湯米線. The noodles were al-dente. The preserved vegetable had an overly soft texture and was quite flavorless. The shredded meat was lightly seasoned. The broth was bland. 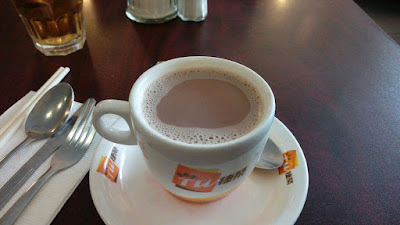 A drink was also included in the breakfast mix & match deal and I ordered a hot Ovaltine 阿華田. The drink was diluted and weak. Not recommended. 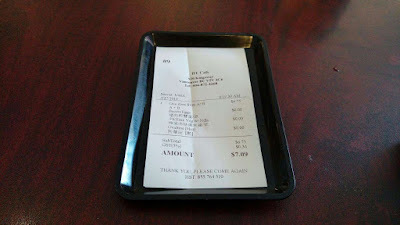 The above budget-friendly breakfast combo was only of $7.09CAD, including tax. Unbeatable deal! In the evening, I wasn't feeling too well and wanted a bowl of soup noodles. I was open to anything...fish soup noodles, chicken/pork pho, wonton noodles, etc. 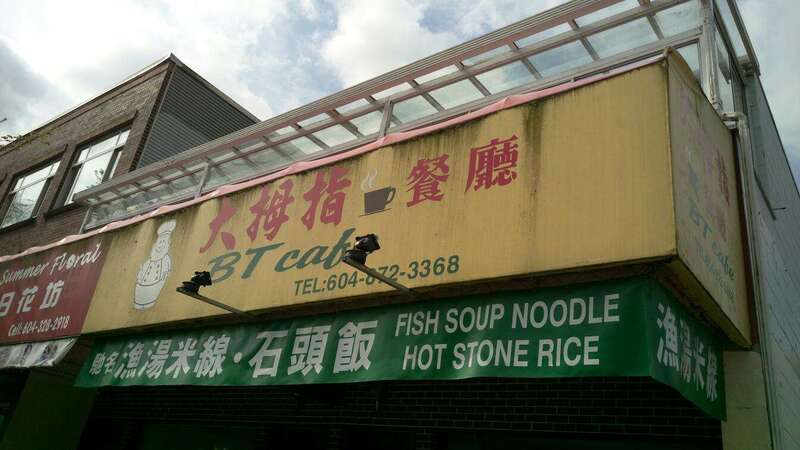 Buddha Boy made the executive call of taking me to fish soup noodles and I made the final say of going to BT Cafe 大拇指餐廳 again. Yes, twice in one day, for me, that is. As expected, I went with the Noodles Combos At Your Choice 魚湯米線百搭餐. My bowl consisted of Ginger & Peppercorn Fish Soup 胡椒生薑魚湯 with Fish Tofu 港式魚腐, Vietnamese Ham 越南扎肉, Pork Cheek 豬頸脊, Pork Stomach 豬肚 and Ramen 拉麵. Each bowl of combo soup noodles normally includes tofu skin 腐皮, button mushrooms 蘑菇 and napa cabbage 紹菜 (大白菜). Due to my TCM herbal medications, I asked for no napa cabbage. 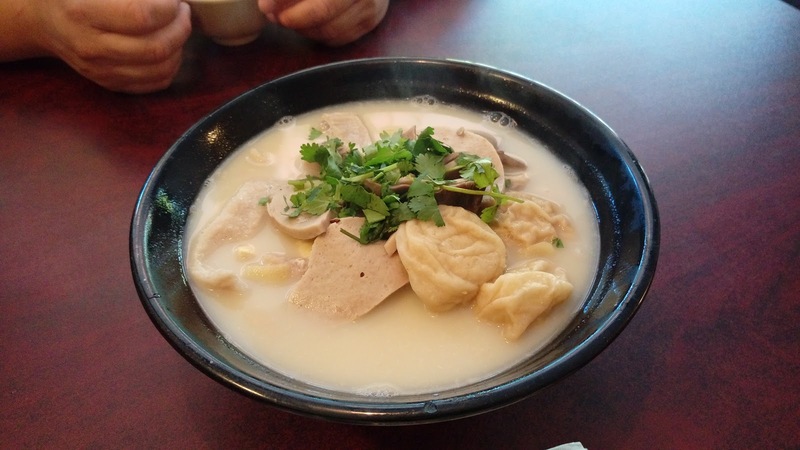 Similar to most restaurants that offers such mix & match deal, the so-called "fish" soup base is never just fish, it's usually a blend of fish and pork/chicken, or all three. When the bowl arrived, we could smell the strong fish essence in the broth, but of course, as we took sips of it, pork bone broth was evident. The broth was quite soothing with its strong core taste of ginger and random peppery kicks. Honestly, I don't know how much truth lies in their clause of "NO MSG ADDED"...I was constantly thirsty after dinner. The toppings were store-bought quality so nothing much to comment about except for the fish tofu, which tasted like it was starting to change. The noodles were overcooked. 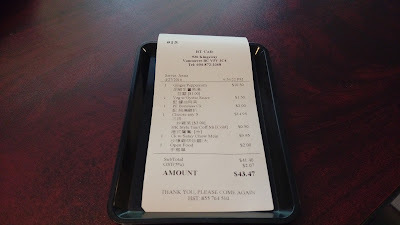 With my mix & match soup noodle combo, I could order two side dishes (one meat and one vegetable) at discounted prices. 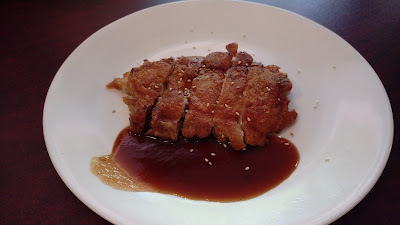 For meat, Buddha Boy chose Teriyaki Chicken Fillet 照燒雞柳. While soft, the chicken was slightly overcooked so it has lost its moist tenderness. There was only one vegetable side available to order with the soup noodle combo. 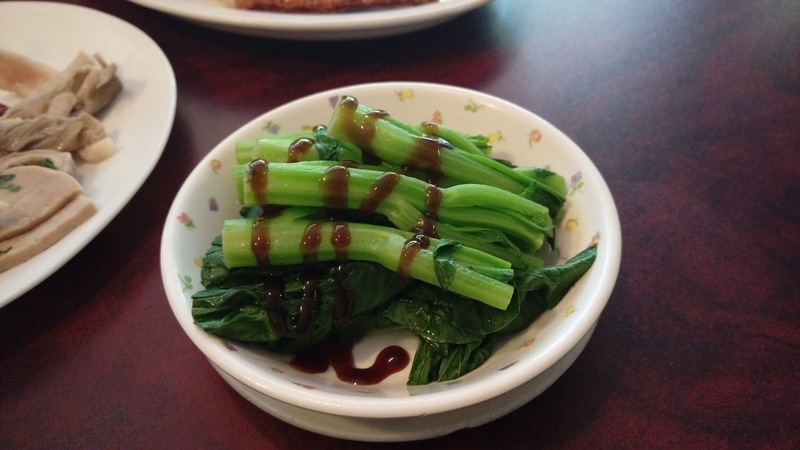 According to the server, the Vegetable with Oyster Sauce 蠔油時菜 is usually blanched choy-sum, or Chinese Flowering Cabbage. Buddha Boy had the Choice of Entree 超值至尊皇牌拚餐 combo deal and opted for three types of meat: Pan Fried Chicken Fillet 香煎雞扒, Pan Fried Pork Chop with Herbs 香草煎豬扒, Pork Loin Cutlet 吉列豬柳. Instead of white rice, spaghetti or fries, Buddha Boy asked for Stir-Fry Vegetable 炒什菜. The dipping condiment was Garlic Sauce 蒜蓉汁. Because Buddha Boy also ordered another noodle dish, this was pretty much packed to go with the exception of pork cutlet and vegetables. 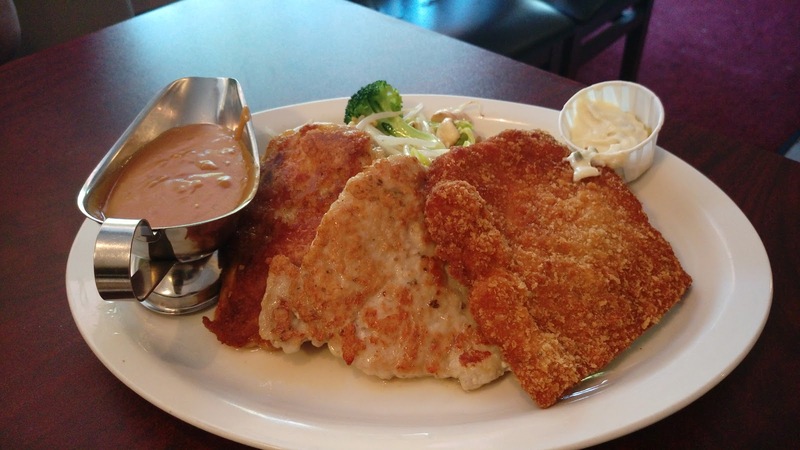 The breaded cutlet was moist with a nice crispy outer coat. The lightly seasoned stir-fried vegetables were a mix of broccoli, bean sprouts, cabbage and mushrooms. The garlic gravy didn't have much garlic taste. A bowl of Cream of Corn & Ham 粟米火腿忌廉湯 accompanied Buddha Boy's mix & match combo plate. 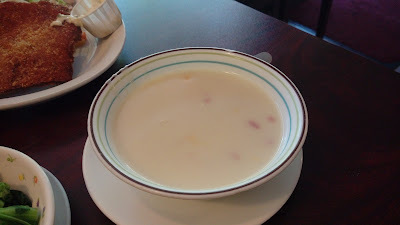 The soup had very minimal amount of corn and ham, almost next to none. The soup was quite runny. Buddha Boy wanted crispy noodles. Originally, he wanted the common house special chow mein 招牌炒麵, but to our surprise, there's no such thing here. 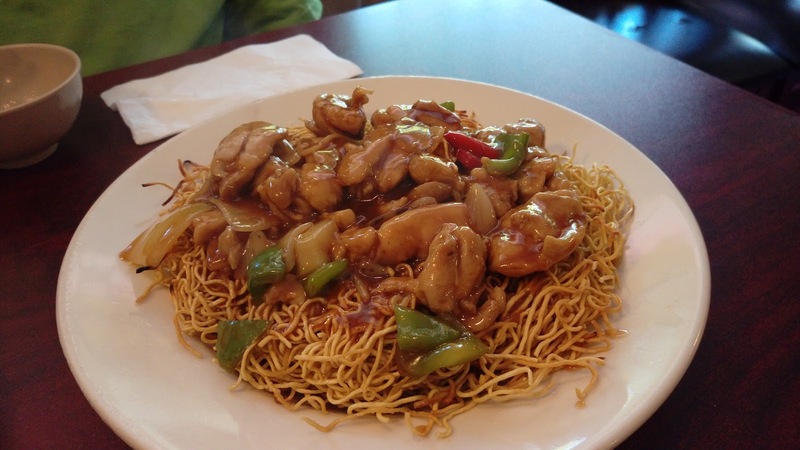 Our server suggested the Satay Chicken Chow Mein 沙嗲雞球炒麵. While Buddha Boy was satisfied with the delightful crispy noodles, the chicken meat was weak in its sa-cha seasoning. Both of our mix & match combo deals came with drinks. With my dietary restrictions, I really didn't have much choice except to order a hot Ovaltine 阿華田 again. 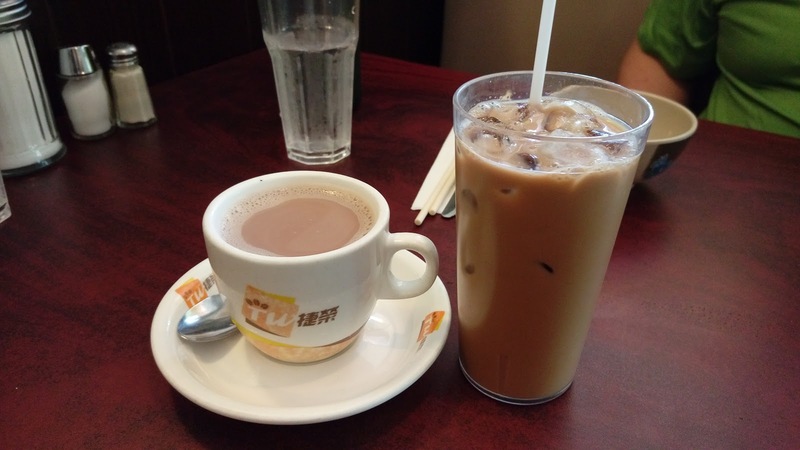 Buddha Boy had a cold Hong Kong Style Tea & Coffee Mixed 港式鴛鴦. Both failed. These were diluted, water-down and simply lacked all the fundamental tastes in every which way. Honestly, unless the drinks are included in your combo deals, do not waste your hard earned money. You're better off sticking to the house tea or plain water. From what we have experienced, the drinks here were beyond disappointing. In fact, the drinks here were naturally depressing. Prices were economical. Food was acceptable. Service was sluggish. 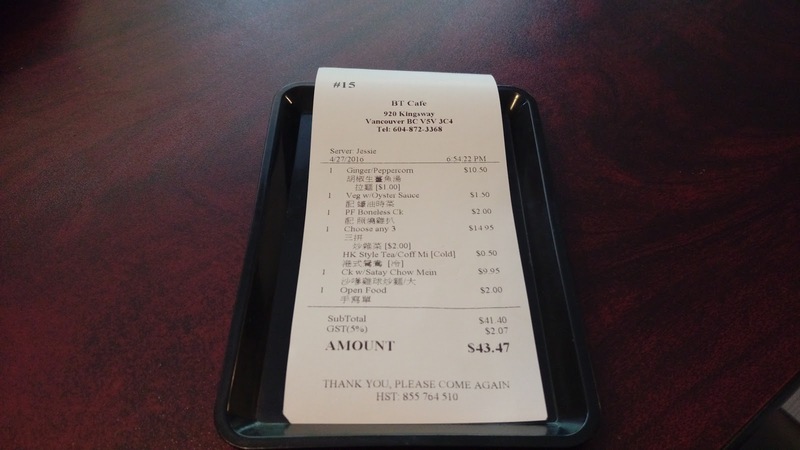 Since there are so many places out there that offers better food at approximately the same price points, we're not sure if we'd return anytime soon. Maybe only for breakfast since the morning deals are unbeatable.